(Nanowerk News) Rocky planets are thought to form through the random collision and sticking together of what are initially microscopic particles in the disc of material around a star. These tiny grains, known as cosmic dust, are similar to very fine soot or sand. However, in the outer regions around a brown dwarf -- a star-like object, but one too small to shine brightly like a star -- astronomers expected that grains could not grow because the discs were too sparse, and particles would be moving too fast to stick together after colliding. Also, prevailing theories say that any grains that manage to form should move quickly towards the central brown dwarf, disappearing from the outer parts of the disc where they could be detected. "We were completely surprised to find millimetre-sized grains in this thin little disc," said Luca Ricci of the California Institute of Technology, USA, who led a team of astronomers based in the United States, Europe and Chile. "Solid grains of that size shouldn't be able to form in the cold outer regions of a disc around a brown dwarf, but it appears that they do. We can't be sure if a whole rocky planet could develop there, or already has, but we're seeing the first steps, so we're going to have to change our assumptions about conditions required for solids to grow," he said. ALMA's increased resolution compared to previous telescopes also allowed the team to pinpoint carbon monoxide gas around the brown dwarf -- the first time that cold molecular gas has been detected in such a disc. 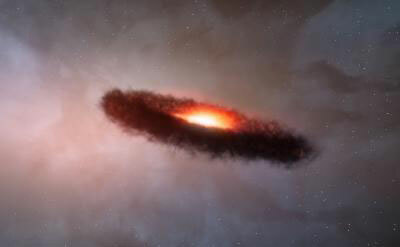 This discovery, and that of the millimetre-size grains, suggest that the disc is much more similar to the ones around young stars than previously expected. Ricci and his colleagues made their finding ("ALMA OBSERVATIONS OF -OPH 102: GRAIN GROWTH AND MOLECULAR GAS IN THE DISK AROUND A YOUNG BROWN DWARF"; pdf) using the partially completed ALMA telescope in the high-altitude Chilean desert. ALMA is a growing collection of high precision, dish-shaped antennas that work together as one large telescope to observe the Universe with groundbreaking detail and sensitivity. ALMA "sees" the Universe in millimetre-wavelength light, which is invisible to human eyes. Construction of ALMA is scheduled to finish in 2013, but astronomers began observing with a partial array of ALMA dishes in 2011. "ALMA is a powerful new tool for solving mysteries of planetary system formation," commented Leonardo Testi from ESO, a member of the research team. "Trying this with previous generation telescopes would have needed almost a month of observing -- impossibly long in practice. But, using just a quarter of ALMA's final complement of antennas, we were able to do it in less than one hour!" he said. In the near future, the completed ALMA telescope will be powerful enough to make detailed images of the discs around Rho-Oph 102 and other objects. Ricci explained, "We will soon be able to not only detect the presence of small particles in discs, but to map how they are spread across the circumstellar disc and how they interact with the gas that we've also detected in the disc. This will help us better understand how planets come to be."